Isaiah Hankel, “The Cheeky Scientist,” guides WSU graduate students through a workshop earlier this year. 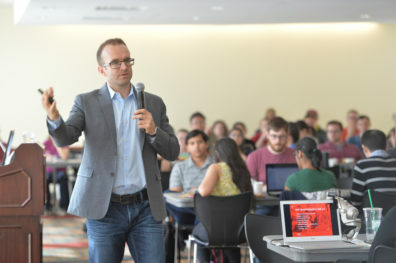 The workshop was a part of WSU’s innovative Professional Development Initiative. Life as a graduate student can be singularly focused on developing specialized expertise. A new program is helping broaden perspectives for Cougar grad students often while providing useful resources for faculty as well. Washington State University’s Professional Development Initiative brings the long view into sight with skill development, advice, and anecdotes on life after grad school. An ongoing series of workshops addresses a wide variety of topics, from working in academics, to balancing career and family life, to taxes. The series addresses traditional professional development, fused with personal development and skill development. The Professional Development Initiative is a collaborative effort between the Graduate School, the Graduate Professional Student Association, and WSU’s academic colleges. By combining resources and perspectives, the program is relevant for students across disciplines and timelines. Those core components – Academic and Career Development, Communication and Collaboration, Leadership and Professionalism, and Personal Wellbeing – were informed by student and faculty input. The events in the PDI lineup are sometimes specific to a particular field, but most can be applied universally. Shantel Martinez, GPSA’s director of professional development says with the number of events on the calendar, it’s easy for students to find something that interests them. Among the most popular events have been the “Industry Job Series,” by Dr. Isaiah Henkel (The Cheeky Scientist), and the “Versatile PhD,” series with Dr. Paula Chambers. On March 28, President Kirk Schulz and Professor Noel Schulz are presenting on, “Family, Career, and Fun – Lessons Learned as a Dual Career Couple.” On April 14-16, all students, faculty, and staff are invited to PDI’s workshop on, “Liberating Structures: Practical Ways to Invite Freedom and Responsibility in the Classroom, Boardroom, and Laboratory,” with special guest Fisher Qua. Overall attendance for the year is closing in on 1,000, and nearly one in 10 grad students has attended a PDI event already. Grad students are able to livestream events, and the group is working to develop a video archive for those who cannot attend the live events. The group is keeping close tabs on the results of the events. The Professional Development Advisory Council, to which the college deans appoint representatives, was formed to help assess the outcomes, and find ways to improve. The PDI syncs smoothly with the Strategic Plan’s “Transformative Student Experience,” and “Institutional Effectiveness,” themes. For more information on the Professional Development Initiative, and to learn how you can get involved, visit gradschool.wsu.edu/pdi.